In July 1944 Raoul Wallenberg, an ordinary business man from Stockholm, left the quiet of neutral Sweden and ventured into the heart war-torn, Nazi-occupied Hungary. By December, he had saved over 100,000 lives. 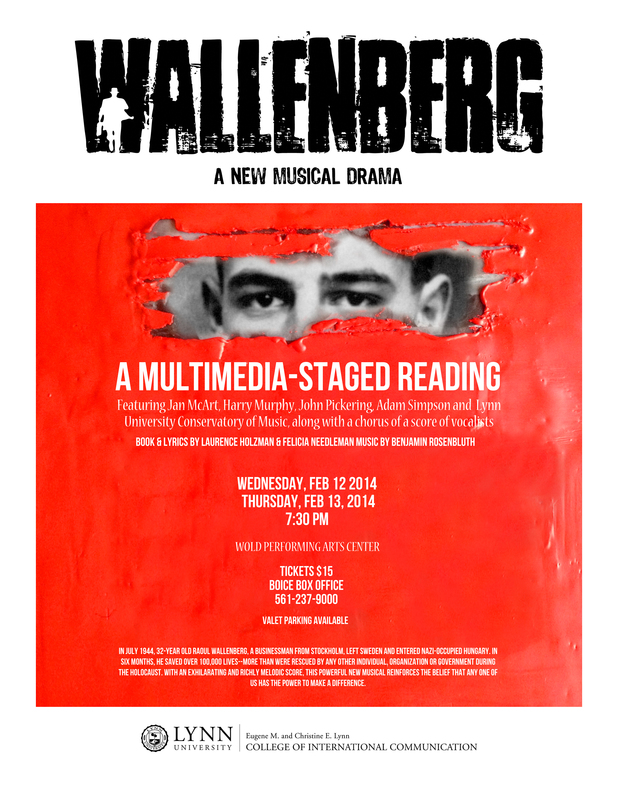 staged reading of Wallenberg, A New Musical Drama. The production will take place at Lynn University’s Wold Center for the Performing Arts on February 12th and 13th only. With book and lyrics by the 2006 Kleban Award-winning team of Laurence Holzman and Felicia Needleman, and music by Benjamin Rosenbluth, Wallenberg, A New Musical Drama recounts the fascinating and uplifting story of one of the greatest heroes of the twentieth century. Lynn University’s Professor Harry Murphy (College of International Communication) will direct the production which will feature Jan McArt, Harry Murphy, John Pickering, and Adam Simpson. Students and faculty of the Lynn University Conservatory of Music will also participate. Producer Douglas C. Evans says: “Wallenberg, A New Musical Drama reaffirms an important message to all of us as to what each one of us can do to make the world a better place; Raoul Wallenberg’s life and legacy is not only an inspiration to me but to anyone who cares about the world and people around us.” Evans’ theatrical experience includes serving as Chief Operating Officer of Nederlander Worldwide Entertainment, CEO of the Bushnell Center for the Arts, The Old Globe in San Diego and the Stamford Center for the Arts. He is also the Founding President of Classical South Florida 89.7FM and 90.7FM. Wallenberg, A New Musical Drama had its premiere public presentation in March 2004 in the First Draft Musicals reading series at Symphony Space in NYC. In January 2005, another reading was presented at the Jewish Community Center in Manhattan in commemoration of the 60th anniversary of Mr. Wallenberg’s mysterious disappearance. In September 2006, a staged reading played to full houses at New World Stages as part of the New York Musical Theatre Festival. 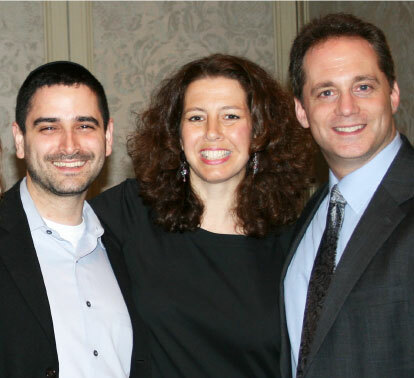 The show had its world premiere production at the White Plains Performing Arts Center in the fall of 2010. The Lynn University production will be Wallenberg’s South Florida premiere. Born in 1912 into one of Sweden’s most prominent and wealthiest banking families, Raoul Wallenberg was an architect (educated at the University of Michigan), diplomat, and humanitarian. A Jewish businessman and colleague, Kalman Lauer recommended Wallenberg to the American War Refugee Board who were looking for a Swedish citizen to take on the mission of rescuing the Jews of Budapest in 1944. Wallenberg’s bravery and ingenuity came into play immediately upon his arrival in Hungary. He created Swedish protective papers, known as schutzpasses, which had no legal validity but which managed to fool the Nazis and Hungarian fascists and served to keep thousands of Jews protected from the deportations to Auschwitz; he kept hundreds of Jews sheltered in Swedish “safe houses” which he bought or rented with U.S. funds; and when the Nazis were about to bomb the Budapest Ghetto, home to the city’s remaining 70,000 Jews, it was Wallenberg who persuaded the general in charge to call off the attack. In January 1945, the Soviets, who had just entered Budapest, abducted and imprisoned Wallenberg, probably because his mission had been funded entirely by the United States. He was never again seen in the free world. In 1981 President Ronald Reagan made Raoul Wallenberg an honorary U.S. citizen.